When I was 20, I spent a semester in Florence, Italy. I arrived a fairly committed vegetarian but within a week or 2, there I was, debating the merits of Prosciutto di Parma versus Prosciutto di San Daniele at the market, working up the nerve to try a tripe sandwich, and being schooled on how to chop chicken livers with a mezzaluna to make the ubiquitous crostini toscani. Needless to say, it was an exciting time in my life. I will admit, it took me a couple of tries to warm to the rustic chicken liver pâté smeared crostini toscani, but they are literally everywhere in Florence and throughout Tuscany. You go to a restaurant, they’re on the menu. Stopping in at a wine bar? Yup, they’re going to be offered. 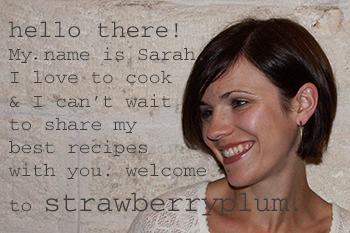 Dinner at a house in the countryside? You can bet on starting with them. They’re unavoidable and even if their rather dull looking appearance doesn’t win your heart at first glance, after a few polite nibbles they start to grow on you. Polite nibbles will turn into voracious bites which will eventually turn into tucking a few in your purse for a midnight snack. And then you’ll return home and realize how much you miss the ugly brown crostini you’d just taken for granted. 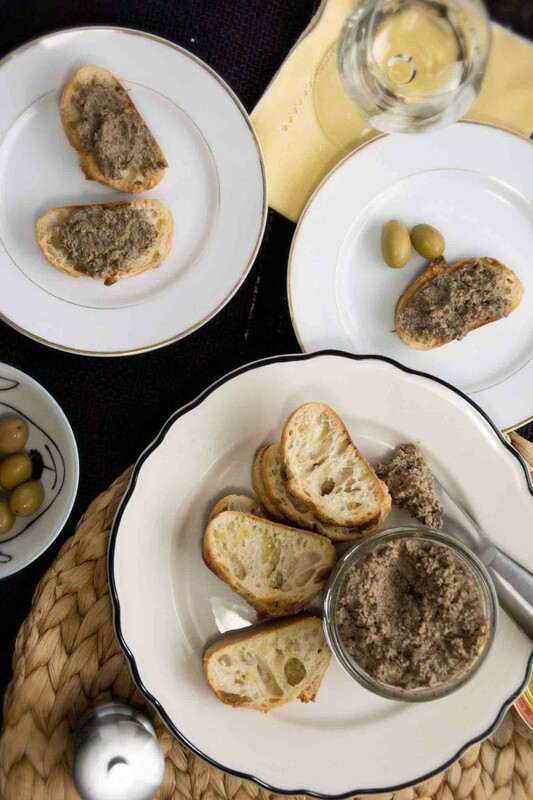 But thankfully, the pâté is ridiculously easy to make. You can make a batch, toast up a pile of crostini, pop a bottle of Chianti, and whisk yourself away to Italy whenever the mood strikes. I find myself doing this quite often. Usually it’s just a tiny batch made from just 1 liver, enough for a couple of toasts to munch on while a chicken roasts, but occasionally I’ll make a bigger batch. 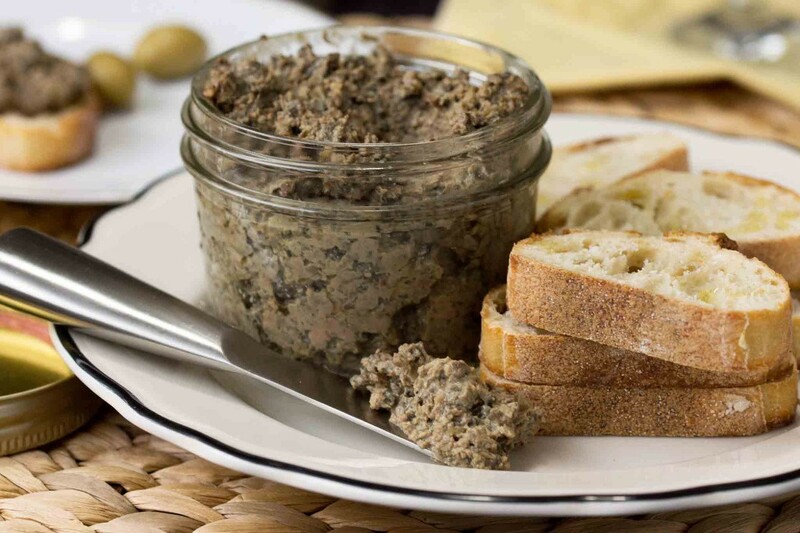 This particular version isn’t exactly the traditional way of making Tuscan chicken pâté, as mushrooms also play a large role. I had over-bought mushrooms and wanted to use them up, so I made a pâté that was half mushrooms, half liver. 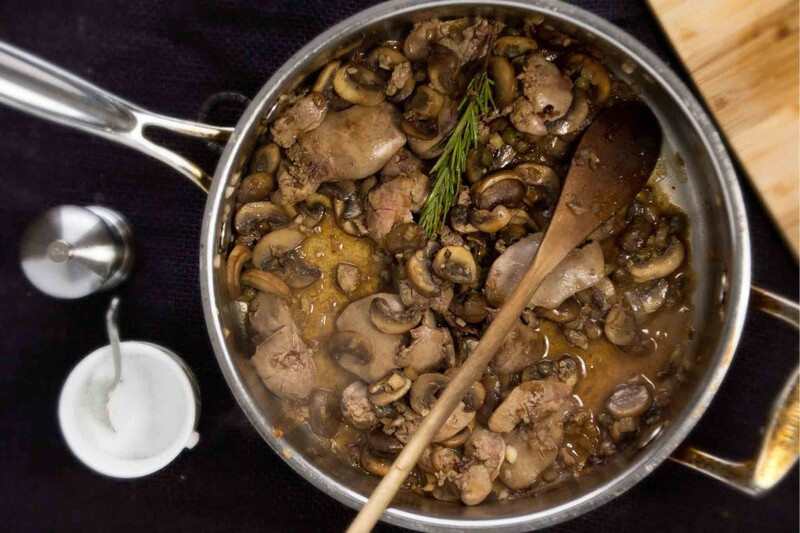 The mushrooms and chicken livers play nicely off each other to make a spread that is rich and earthy and traditional or not, just eyeing it up, I immediately return to my 20 year old self, off exploring a new place in the world and a new world of food. 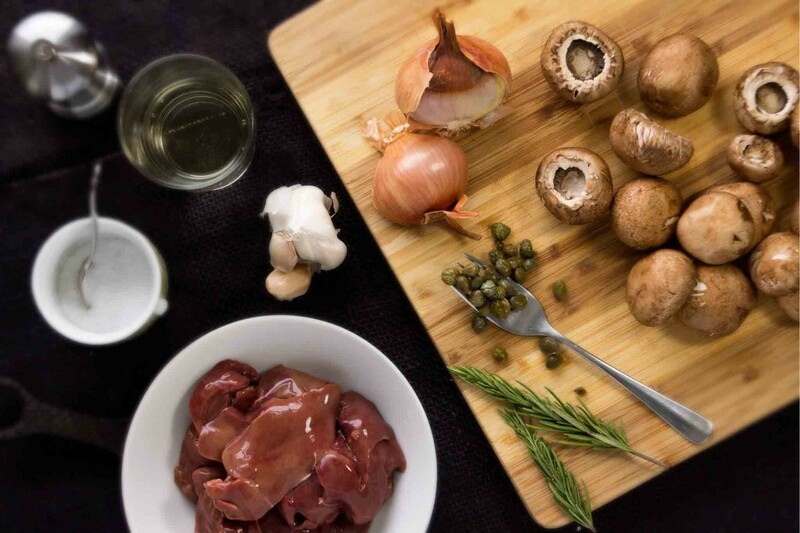 You’ll need some chicken livers, a bunch of mushrooms, a shallot, a few cloves of garlic, a couple sprigs of rosemary, a forkful of capers, and a splash of white wine. 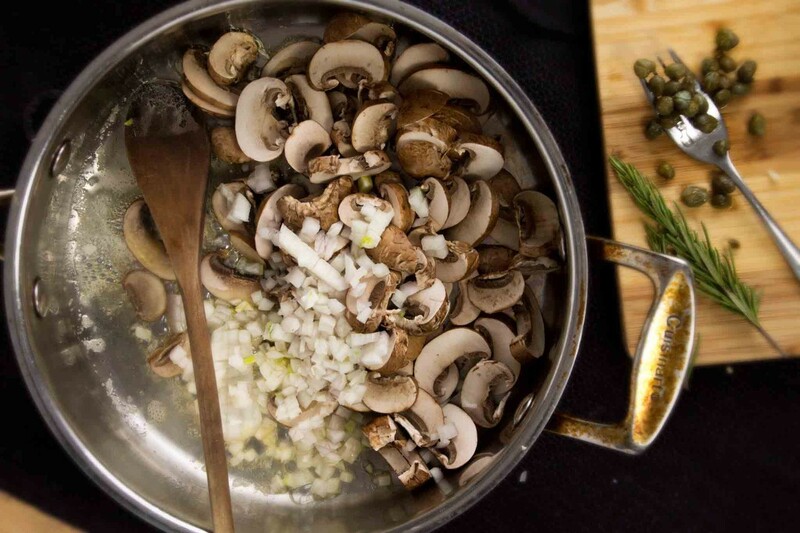 Start by sauteing the shallot with the mushrooms for a few minutes until the mushrooms are browned and fragrant. Add minced garlic, capers, and the rosemary and saute for another minute or so. After the mushrooms have browned, scoot them off to the side. Add the chicken livers and sear on both sides. Pour in a bit of wine and simmer until most of it has cooked off and the livers are just a tiny bit rosy in the center. 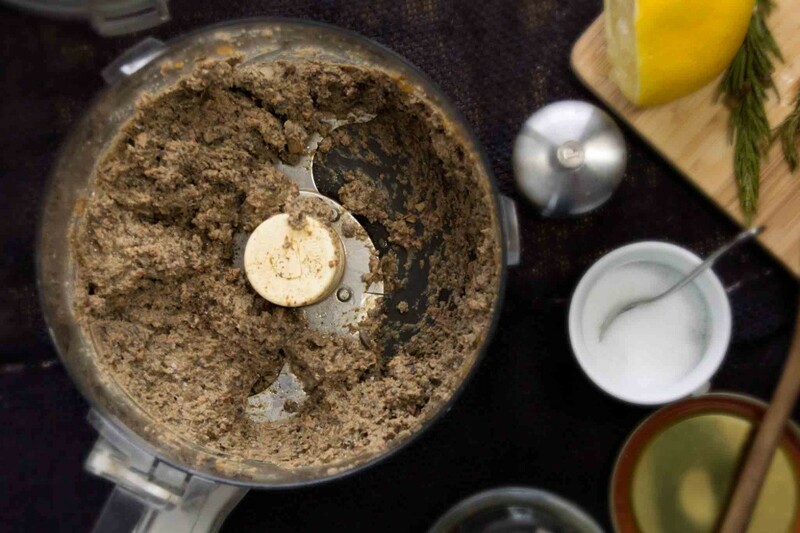 Transfer the livers and mushrooms to a food processor and process until you have a thick, slightly chunky spread or if you want to show off your old school style, feel free to toss everything on a cutting board and use your mezzaluna to chop everything into a coarse paste as a proper Italian would. All that’s left to do is make some crostini and open a bottle of wine, then we’re off to Italy. At least that’s where are heads and our bellies will be heading. 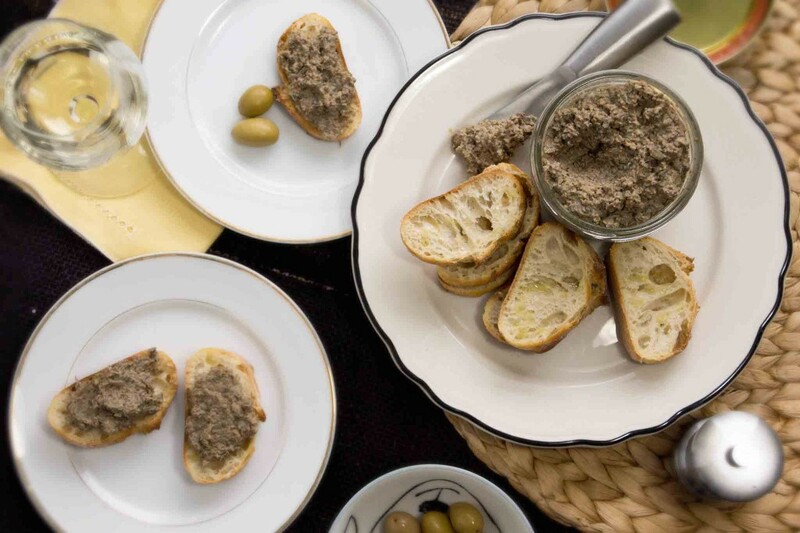 In this take on the traditional Tuscan appetizer, chicken livers share the stage with cremini mushrooms to make a rustic pâté to spread on crostini. Heat the butter and olive oil in a large skillet over medium-high heat. Add the shallots and mushrooms and sauté until the mushrooms have browned, about 5 minutes. Season with a few pinches of salt. Add the garlic, rosemary, and capers and continue to sauté until the garlic is fragrant, about 1 minute. 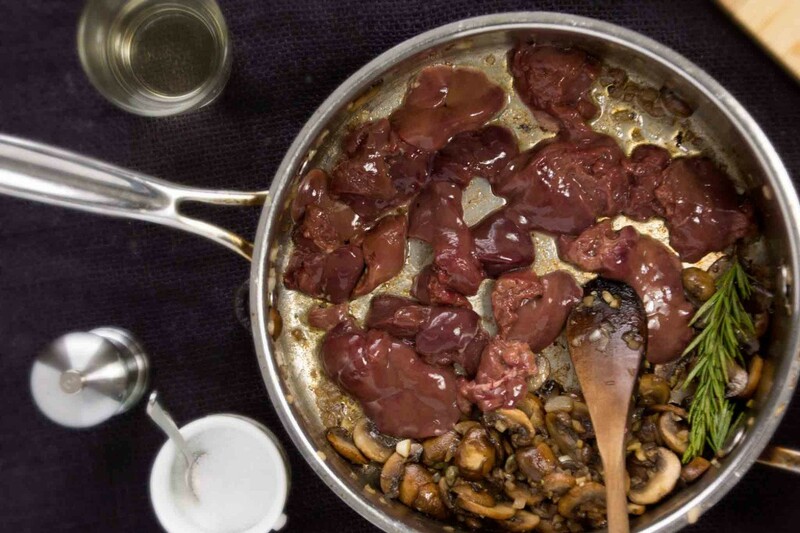 Move the sautéed mushroom mixture to one side of the pan and place the livers in the empty space. Sear for 2 minutes on each side. You'll want to toss the mushrooms once or twice to make sure they don't stick to the bottom of the pan. After the livers have been seared, add the white wine. Simmer for a minute or 2 until most of the wine has cooked off, scraping up the brown bits on the bottom of the pan. 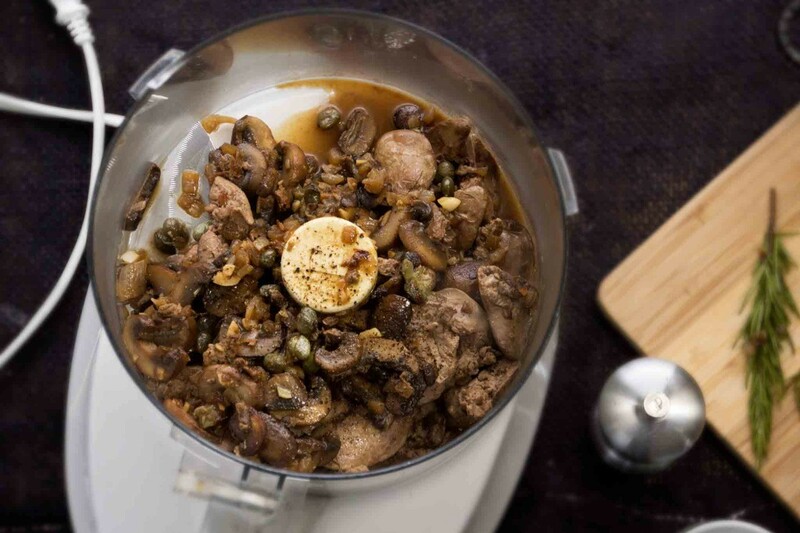 Transfer the livers and mushrooms to the bowl of a food processor and process until the mixture is nearly smooth. You don't want it super smooth, it should be a bit "rustic" in texture. Taste. Stir in the lemon juice to brighten the flavors and season as needed with salt and black pepper. Serve warm or at room temperature, spread on crostini. What a perfect appetizer to have on hand! How long do you think it will last and can it be frozen? It will hold up for a few days in the refrigerator (just let it come up to room temp before serving) and can be frozen for a couple of weeks.